Stoughton, 7 @ Canton, 14 – Final – Click here for a Recap and Photo Gallery from this game. 2nd Quarter: (C) Johnny Hagan 1-yard rush, Owen Lehane XP good. 3rd Quarter: (C) Kyle Fitzgerald 9-yard rush, O. Lehane XP good. 4th Quarter: (S) John Burke 10-yard pass to Alex Iverson, Josh Cocchi XP good. 1st Quarter: (A) Justin Cote 5-yard rush, 2pt rush failed. 2nd Quarter: (A) J. Cote 1-yard rush, 2pt rush failed; (A) Jason Weir 24-yard rush, J. Weir 2pt rush good. 3rd Quarter: (OA) Cam Perron 1-yard rush, XP blocked; (A) J. Cote 11-yard rush, 2pt pass failed. 4th Quarter: (A) J. Weir 29-yard pass to Jacob Weatherford, XP failed. 1st Quarter: (NA) Nick Raneri 3-yard rush, XP no good; (NA) Brendan McHugh 2-yard rush, 2pt conversion failed. 3rd Quarter: (NA) B. McHugh 11-yard rush, N. Raneri 2pt rush. 4th Quarter: (NA) N. Raneri 13-yard pass to Ryan Gaumond, Tyler DeMattio XP good; (NA) Jacob Silva 3-yard rush, T. DeMattio XP good. Franklin, 14 @ King Philip, 35 – Final – Click here for a Recap and Photo Gallery from this game. 1st Quarter: (KP) Robbie Jarest 18-yard pass to Timmy Nault, Cole Baker XP good. 2nd Quarter: (KP) R. Jarest 28-yard pass to Deric Casado, C. Baker XP good; (F) Nick Gordon 1-yard rush, Parker Chevrant XP good. 3rd Quarter: (KP) R. Jarest 25-yard pass to David Morganelli, C. Baker XP good; (KP) Ryan Halliday 12-yard rush, C. Baker XP good. 4th Quarter: (KP) Sam Callanan 12-yard rush, C. Baker XP good; (F) N. Gordon 84-yard pass to Ryan Driscoll, P. Chevrant XP good. 1st Quarter: (M) Cincere Gill 70-yard rush, 2pt failed; (T) Noah Leonard 1-yard rush, Coby Adams XP good; (M) Aidan Sacco 6-yard rush, C. Gill 2pt rush. 2nd Quarter: (M) Vinnie Holmes 21-yard rush, Michael DeBolt XP good. (T) N. Leonard 14-yard rush, C. Adams XP good. 4th Quarter: (M) C. Gill 17-yard rush, 2pt failed; (M) V. Holmes 34-yard rush, M. DeBolt XP good. Stoughton, 1 @ Norwood, 3 – Final – Stoughton’s Ted Lucas scored his first career goal to cut the deficit to just one late in the game but the Mustangs tacked on an insurance goal to seal the win. Foxboro, 5 @ Sharon, 0 – Final – Foxboro came out firing on all cylinders, scoring five goals in the first half to earn two points on the road. Jordyn Collins set the tone inside the opening minute, taking a pass from Lizzy Davis and scoring to put the visitors ahead. Kenzi Fraser, Kailee McCabe, Katie Hunter, and Katelyn Mollica (from Kaitryn Franchino) all scored once for the Warriors. North Attleboro, 1 @ Braintree, 0 – Final – North Attleboro bounced back from a loss to Foxboro with a solid non-league road win. Ashlyn Gaulin scored the game’s only goal when she followed up her own shot that had caromed off the crossbar and she tapped in the rebound. North coach William Wallace praised the play of Kayla Pasquel, Haley Ferrin, Lydia Santos, and Bri Westcott in the middle of the field. Emma Noreck earned the clean sheet in goal. Franklin, 4 @ Attleboro, 0 – Final – Cassi Ronan set up a pair of goals in the first half and the Panthers scored two more in the second half to beat Attleboro. Ronan assisted on Regan Paterson’s goal that put the Panthers up 1-0, and then set up Victoria Quinn as Franklin took a 2-0 lead into half. Sara Carney and Stephanie Bell each scored unassisted goals in the second half and Anna Jardine made four saves in goal for the shutout. King Philip, 6 @ Oliver Ames, 1 – Final – Meghan MacDonald, Alli Meehan, and Nicole Connor all scored in the first half, helping the Warriors build a 3-0 lead that it never relinquished in a win over Oliver Ames. Abby Nixon had an assist on MacDonald’s opening goal with 12:49 left in the first half. Meehan set Connor up with 4:41 left in the half, and then switched roles for a 4-0 lead less than three minutes into the second. Meehan finished with three goals and an assist and sophomore Olivia Kulesza added a late goal for KP. Oliver Ames sophomore Brynna Courneen scored her first goal of the season off a penalty corner in the second half. Mansfield, 0 @ Taunton 0 – Final – Taunton goalie Emma Sheehan made 10 saves to help keep the contest equal. Stoughton, 2 @ Sharon, 0 – Final – Allie Howe and Haley Nelson each scored once in the second half to lead the Black Knights to a win on the road at Sharon. Canton, 3 @ Milford, 1 – Final – After splitting the first two sets, Canton won a close third game and went on to finish the match with a 3-1 victory (25-15, 18-25, 25-23, 25-16). Erin Devine has a great night for the Bulldogs, finishing with 12 kills and six blocks. Taylor Harris added nine kills, two blocks and 12 digs, Nicole Brown continued to impress with 22 assists, five kills, three aces and 11 digs, and Emily Morrison and Megan McDonough (five aces) combined for 19 digs. King Philip, 3 @ Oliver Ames, 0 – Final – King Philip went on the road and recorded a 3-0 sweep (25-7, 25-21, 25-20) against Oliver Ames. KP middles Catherine Waldeck (12 kills, two blocks) and Nicole Coughlan (seven kills, five blocks, two aces) both had strong games for the Warriors while, Kat Kmetz added 12 digs, two kills, and a pair of aces, and Shayla Weitzman finished with 14 digs, four aces, and 13 service points. For Oliver Ames, senior Jackie Raymond had eight aces, senior Sadie Homer finished with 36 digs, and junior Allie Kemp had 16 assists. Mansfield, 3 @ Taunton, 2 – Final – Mansfield fell behind 2-1 but battled back to win the fourth set, and went on to win the decisive fifth set for a win over Taunton (16-25, 25-23, 24-26, 25-17, 15-7). For Mansfield, Greenly Kelly had nine kills, four blocks and 14 service points, Sam Sternberg added 15 digs and 10 service points, Olivia McGrath had a nice game with 13 kills and 10 service points, and Katie Dardinski chipped in with nine digs and 13 service points. Foxboro, 173 @ Oliver Ames, 153 – Final – Oliver Ames picked a pair of wins, including a divisional victory, by beating Foxboro and Taunton in a tri-match at Pine Oaks. Nolan Donze paced Oliver Ames with a 36, Liam Barry shot 38, Ryan Bock carded a round of 39, and Justin Shapiro finished with a 40. Franklin, 163 vs. Medway, 178 – Final – Franklin defended its home course against non-league foe Medway on Friday afternoon. Quinten Faro paced the Panthers with a team-low round of 40 while Matt D’Errico and Jack Paterson each shot a 41. North Attleboro, 191 @ Sharon, 160 – Final – Ethan Skelly shot a 37 and Corey Carter shot a 38 to Sharon to a win at the Cape Club of Sharon. Max Brody carded a 41 and Andrew Glaser shot 44 to contribute to the win. Stoughton, 0 vs. Quincy, 4 – Final – Quincy scored twice in each half to pull out the victory. Sophomores Nolan Gerome and Mateus Ribeiro made their first varsity starts for the Black Knights and Fabio Ponce de Leon made his return from injury to help bolster the Stoughton midfield and create several scoring opportunities. Taunton, 1 @ Sharon, 2 – Final – Emily Griffin and Maxine Gordon scored the goals for Sharon to help the Eagles pick up their first win of the season. Jessie Taurnoff had an assist for the Eagles. Emily O’Gara scored the Taunton goal, assisted by Khy Camaro. Izzy Anslow made four saves in the loss. Stoughton, 1 @ Quincy, 7 – Final – Maggie Veliotis scored the lone goal for the Black Knights. North Attleboro, 1 @ Attleboro, 1 – Final – Anna Beck scored with a penalty stroke in the second half for Attleboro’s goal. 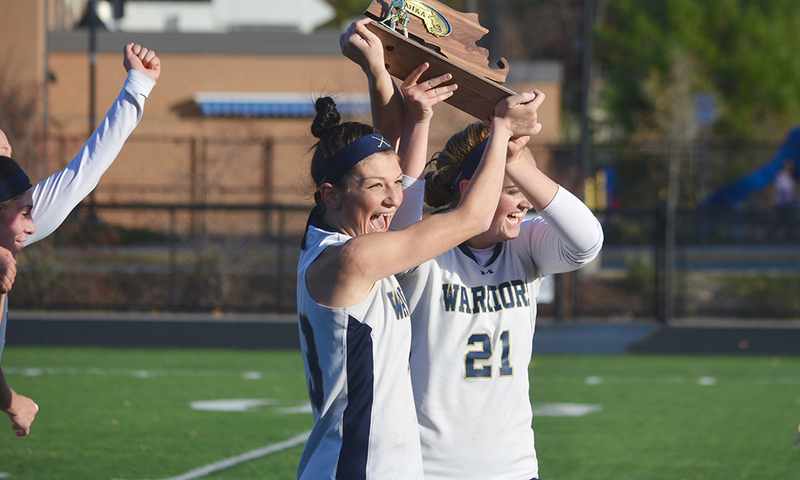 Canton, 0 @ King Philip, 2 – Final – Alli Meehan scored both of the goals for the Warriors to help KP win the battle of defending league champs. Meehan scored the first goal after nine minutes with an unassisted run through the Canton defense and the second off an assist from Nicole Connor. Grace May made two saves in the win and Sammy Robinson played well in the KP defense. Foxboro, 4 @ Oliver Ames, 1 – Final – Sophia DiCenso scored a hat trick and Jaime Notarangelo added a goal for the Warriors. Hannah Stryke scored with two minutes remaining in the game off a Maggie Woods assist. OA was helped going forward in the second half by Brynna Courneen, Cassie Gennis, Kayla Lozzi, and Woods. Stoughton, 0 @ Franklin, 8 – Final – Amanda Lewandowski led the way for the Panthers with two goals and two assists to help Franklin pull away in the second half. Regan Paterson had a hat trick and Victoria Quinn and Cassi Ronan each had a goal and an assist for the win. Ashley Reutlinger scored once and Emma DiPhillipo had an assist, while Anna Jardine had five saves in the win. Kayla Laboy made 11 saves for the Black Knights. North Attleboro, 3 @ Attleboro, 2 – Final – North took the fifth set 15-9 to pull out the victory. The Rocketeers won 25-15, 25-27, 25-17, 25-27, 15-9. Chelsea Calcagni had eight aces, one dig and nine kills in the loss, while Ana Leonardo had five aces and 16 assists and Amanda Kadesevskis had five aces, four kills, and three blocks for the Bombardiers. Canton, 3 @ King Philip, 1 – Final – Canton won 26-24, 19-25, 25-21, 25-15 in a back and forth match. The Bulldogs battled back from 20-12 and 24-20 down in the opening set thanks to strong serving from Julia Minichiello. KP also led 11-4 in the second set and went on to even the match. Canton held on to win the final two sets after several lead changes. Erin Devine had nine kills and eight blocks in the win and Megan McDonough had 15 digs. Canton also got five kills and 15 digs from Taylor Harris, while Nicole Brown had a strong all-around game with 18 assists, 13 digs, and five kills. Caroline Robertson had eight kills for the Warriors, who also got seven kills and three aces from Nicole Coughlin, five kills from Katherine Waldeck, and three kills and two digs from Kat Kmetz. Foxboro, 0 @ Oliver Ames, 3 – Final – OA won 25-18, 25-14, 25-14. Sarah Litwack had 20 assists and led the Tigers on and off the floor in the win. Sadie Homer had 27 digs and three aces and Jackie Raymond had nine kills, six aces, and three blocks in the win. Stoughton, 0 @ Franklin, 3 – Final – The Panthers stayed unbeaten with a 25-15, 25-17, 25-13 victory. Ellie Wisnieswki had seven kills and nine digs for the Panthers. Maggie Doyle had five kills and five solo blocks and was a force at the net for Franklin. Hailey Sanders and Peyton Arone each added five kills, libero Riley Marino had 10 digs and a pair of aces, and setter Lauren McGrath had 30 assists and five aces for a very balanced Franklin attack. Milford, 3 @ Mansfield, 1 – Final – The Hawks won the match in four sets (21-25, 25-20, 29-27, 25-22). Greenly Kelly had 14 services points for the Hornets, while Emily Dardinski had 10 kills and Olivia McGrath had six kills in the loss. Canton, 169 @ King Philip, 168 – Final – KP pulled off a 1-stroke win against Canton to even its record on the season. Nate Ihley shot a 39 to lead the way for the Warriors, matched by a 39 from Canton’s Mike Leonetti. Kayla Schuberth, Jared Curran, and Jack Hastry all shot rounds of 43 for KP. Mike Gobbi and Thomas Singleton each carded a 43 for the Bulldogs and Ryan Nolte shot a 44. Franklin, 174 @ Taunton, 206 – Final – Matt D’Errico shot the low round of the day for Franklin, carding a 39 in the win. North Attleboro, 169 @ Stoughton, 184 – Final – Luke Bainton of Stoughton and Jillian Barend of North shot co-medalist rounds of 40. Aidan Weir and Matt Wanless each carded a 42 in the win. Franklin, 21 @ Milford, 0 – Final – Click here for a Recap and Photo Gallery from this game. Second Quarter: (F) Nick Gordon 28-yard pass to Ryan Driscoll, Parker Chevrant XP good. Third Quarter: (F) N. Gordon 7-yard rush, P. Chevrant XP good; (F) N. Gordon 6-yard run, P. Chevrant XP good. 1st Quarter: (D) Dylan Pacheco 8-yard pass to Nathan Oliver, XP good. 3rd Quarter: (A) Jason Weir 1-yard rush, 2pt failed; (A) Isaac Gudiel 55-yard interception return, Justin Cote 2pt rush. 4th Quarter: (A) J. Cote 4-yard rush, Colby Briggs XP good. First Quarter: (KP) Cole Baker 35-yard field goal. Second Quarter: (KP) Ryan Halliday 1-yard rush, C. Baker XP good. Fourth Quarter: (KP) R. Halliday 3-yard rush, C. Baker XP good. 1st Quarter: (M) Nick Marciano 4-yard rush, Nico Holmes XP good; (E) Dillon Doherty 2-yard rush, XP good. 2nd Quarter: (E) D. Doherty 37-yard pass to Tyrese Baptiste, XP blocked; (E) D. Doherty 51-yard pass to Mike Sainristil, 2pt conversion good; (E) D. Doherty 36-yard pass to M. Sainristil, 2pt failed. 3rd Quarter: (E) D. Doherty 10-yard pass to Eli Auguste, XP good. 4th Quarter: (M) Vinnie Holmes 1-yard rush, N. Holmes XP good; (E) Jaden Mahabir 1-yard rush, XP good. 1st Quarter: (NA) Nick Raneri 70-yard pass to Ryan Gaumond, Tyler DeMattio XP good; (BF) Safety. 2nd Quarter: (BF) Tim Ambrosia 5-yard rush, XP blocked; (NA) T. DeMattio 25-yard field goal; (NA) T. DeMattio 28-yard field goal. 3rd Quarter: (BF) T. Ambrosia 1-yard rush, T. Ambrosia 2pt pass to Nick Norko. 4th Quarter: (BF) T. Ambrosia 1-yard rush, William Lynch XP good; (NA) Brendan McHugh 8-yard rush, XP no good. 2nd Quarter: (CM) Darius LeClair 1-yard rush, XP no good. 3rd Quarter: (CM) Owen McGowan 7-yard rush, O. McGowan 2pt rush; (CM) Barrett Pratt 2-yard rush, 2pt failed; (S) Jeff Grier 18-yard rush, Josh Cocchi XP good. 1st Quarter: (T) Noah Leonard 15-yard pass to Brayden Merrill, Coby Adams XP good. 2nd Quarter: (T) Tryton Zavala 11-yard rush, C. Adams XP good; (T) T. Zavala 4-yard rush, C. Adams XP good; (T) N. Leonard 18-yard pass to Wesner Charles, XP failed. 4th Quarter: (D) Elijah Concepcion 8-yard rush, XP good. Attleboro, 4 @ Stoughton, 1 – Final – Attleboro scored three times in the second half to earn a win on the road. The Bombardiers had four different goal scorers on the day. Will Halben opened the scoring on an assist from Mike Russo but Stoughton’s John Neves tied the game going into halftime. Alex Naughton (from Joey Soucy), Justin Lurssen (from Russo), and Hugo Henriquez (from Soucy) scored in the second half for Attleboro. Franklin, 0 @ Canton, 2 – Final – Canton scored once in each half to secure two points with a win over visiting Franklin. Simon Cruz opened the scoring in the 32nd minute as the Bulldogs took a 1-0 lead into the break. Paul Corcoran made it 2-0 just five minutes into the second half. Alejandro Correal notched his first career shutout. King Philip, 1 @ Milford, 2 – Final – Milford’s Lucas Da Silva scored twice in a two minute span to help the Scarlet Hawks complete the comeback. KP took the lead at the midway point of the second half on a goal from Justin Wilson but Da Silva tied it two minutes later, finishing off a flick from Walisson de Oliveira to make it 1-1. Just two minutes later, Joey Madden’s long throw was flicked on by Leo Coelho and finished by Da Silva to make it 2-1. de Oliveira, Anthony Salvador and Cam Doherty played well for Milford. Mansfield, 1 @ Sharon, 1 – Final – Mansfield’s Owen Mullahy scored in the final seconds of the game to help the Hornets grab a point on the road. Sharon took the lead in the first half off a free kick but Mansfield cashed in on a long throw to get the tie. Sharon’s Brian Higgins gave the Eagles the lead with a left-footed shot off a free kick. In the final sesconds, Mansfield’s Cam Eddy’s throw was kept in the box by Sam Nugent, and he found Mullahy in close for the tying tally. Nugent, Ethan Brill-Cass, and Colin Caridi had strong games for the Hornets. Stoughton, 0 @ Attleboro, 3 – Final – Attleboro scored three times in the second half to pull out the win. Isabella Salviati scored a goal and assisted on another and Jess Gates had a pair of assists for the Bombardiers. Briley Harnois opened the scoring off a Salviatie assist. Salviati added the second from Gates and then Sam Fasoldt made it 3-0 with a header off a Gates corner. Attleboro coach Steve Santos is Gates controlled the midfield and Sophia Salviati played well in defense. Ashley Macia earned the clean sheet. Stoughton goalie Brianna Buckley had a strong first half, according to head coach Tara Daniels, to keep the game scoreless. Daniels added that moving Gabi Diaz from midfield to sweeper also helped organize the defense. Canton, 1 @ Franklin, 3 – Final – Olivia Rodman opened the scoring for the Bulldogs but Franklin responded within five minutes on a tying goal by Halle Atkinson. Freshman Stella Regan gave the Panthers the lead and then late in the game Sydney St. Marie added an insurance goal to seal the win. Sharon, 0 @ Mansfield, 4 – Final – Steph Kemp had two goals and an assist and Cassidy McMahon had a brace for the Hornets. Melissa Reef, Sydney Mulkern, and Karina Gemiani each had an assist in the win. Milford, 0 @ King Philip, 3 – Final – Chloe Layne scored twice and Avery Snead had a goal and an assist to keep KP perfect in the league. Snead scored the eventual game-winner with a header off a Faye Veillieux corner after 15 minutes. Nine minutes later, Layne scored from the penalty spot to double the lead before halftime. With 20 minutes left, Layne volleyed in a Snead cross to end the scoring. Taylor Butler made five saves for her third clean sheet of the season. Attleboro @ Stoughton – Postponed to a date and time to be announced. Franklin, 1 @ Canton, 2 – Final – Click here for a recap of this game. Oliver Ames, 3 @ North Attleboro, 1 – Final – The Rocketeers took the lead on a goal by Abby Calistra, but the Tigers scored three straight in the second half to get the win. Hannah Stryke tied the game off a penalty corner, with Maggie Woods picking up the assist. Kayla Lozzi completed a three-on-one break to give OA the lead and Woods added a goal to her earlier assist when she knocked in a rebound off the goalie’s pads. OA coach Sharon Lawrence also praised the midfield play of Meaghan Rockey and Brynna Courneen and the defending of Emily Han. Kara Ostrander made three saves to preserve the win. King Philip, 5 @ Milford, 0 – Final – King Philip raced out to a 3-0 lead at halftime and never looked back in a win over Milford. Nicole Connor opened the scoring with an unassisted tally (23:51), Dana Truini converted a pass from Kate Lindmark (13:32), and Alli Meehan made it 3-0 off of a pass from Connor (1:39). In the second half, Lindmark scored on an assist from Meehan (16:24) and Meegan capped the scoring with 11:50 on a pass from Olivia Kulesza. Grace May and Mackenzie Manning combined for the shutout in net for KP. Attleboro, 0 @ Stoughton, 3 – Final – The Black Knights stayed unbeaten with a three-set win (25-10, 25-19, 25-22). Stoughton coach Erica Batchelder said the team “played together and shared the ball.” Mia Bennett had a strong game in the back row and Alexa Quinones had a great overall performance in the win. Attleboro’s Chelsea Calcagni had seven aces and two kills while Hailey Thake added two kills and a block. Franklin, 3 @ Canton, 1 – Final – Franklin picked up an impressive win over a good Canton team, taking a 3-1 decision (25-21, 13-25, 25-21, 25-9) over the Bulldogs. For Canton, Julia Minichello played great defense with 14 digs and three aces and Nicole Brown was fantastic with 22 assists, 24 digs and four kills. Taunton, 3 @ Foxboro, 1 – Final – Taunton secured its second win of the season with 3-1 (25-19, 25-20, 19-25, 25-20) win on the road at Foxboro. Jaime Brown paced the offense with 16 assists, five aces and a block while Sam Martin added five kills, an ace and a block for the Tigers. Sam Silveira had a strong all around game with three kills, two blocks, and 11 aces while Mckenzie Lucie solidified the back row with strong serve receive and defensive play (six digs). King Philip, 3 @ Milford, 1 – Final – King Philip went on the road and picked up a 3-1 win over Milford (25-23, 21-25, 25-9, 25-14). Grace Ely paced the offense with nine kills and two aces while Catherine Waldeck added nine kills and two blocks, Nicole Coughlan chipped in with five kills, three aces four blocks, Emma Brooks added six aces, and Lillian Carlo led the defense with five digs. Oliver Ames, 2 @ North Attleboro, 3 – Final – The Rocketeers took the final set 15-6 to earn a hard-fought 3-2 (25-17, 15-25, 25-23, 17-25, 15-6) victory. Tatian Sotelo led North with eight kills while Emma Gunn added seven kills. Hayley Gaskin had 15 assists, Joanna Collins-Bilyeu added 12 assists and Lizi Buron anchored the defense with 13 digs. Junior Jordan Bosse led the Tigers with 10 kills and three aces in defeat. OA also got 28 digs and three aces from Sadie Homer and four kills, four blocks, and two aces from Jackie Raymond. Mansfield, 1 @ Sharon, 3 – Final – Mansfield won the third set to prevent the sweep but Sharon finished off the match to earn a 3-1 (25-23, 25-20, 16-25, 25-22) win. For Mansfield, Greenly Kelly had 14 kills, Emily Dardinski added 10 kills, and Sam Sternberg had 14 digs. Canton, 155 @ North Attleboro, 160 – Final – Four Bulldogs shot sub-40 rounds to earn the Davenport win. Tommy Dimock shot a medalist round of 38 to lead the way, while Chris Lavoie, Mike Gobbi and Thomas Singleton each shot rounds of 39. Marcus Costa had North’s low score of the day with a 39. Jillian Barend and Matt Wanless each shot rounds of 40 and Justin Strom shot a 41 for the Rocketeers. King Philip, 169 @ Franklin, 166 – Final – Matt D’Errico shot a 38 to lead the way for the Panthers in a close match at Franklin Country Club. Franklin also got a round of 41 from Quintin Faro and a 42 from Jake Blaney. KP was led by Kayla Shuberth, who shot a 40. Attleboro, 178 @ Oliver Ames, 153 – Final – Thomas Walsh shot a medalist round of 35 in wet conditions to lead the Tigers to their first win of the season. Tate Hadges shot a 38, Liam Barry shot a 39, and James Walsh finished with a 41 for OA. Attleboro’s low round belonged to Ethan Johnson, who shot a 42. TAUNTON, Mass. – Oliver Ames won both meeting with Taunton during the regular season. but Taunton turned the tables in the postseason to even the the season series. First, Taunton won the coin toss on Tuesday (it was actually names picked out of a hat) so that Thursday night’s Div. 1 South playoff game, the first for Taunton in 27 years, would be at Aleixo Stadium. Cheered on by a large, partisan crowd, freshman Alana Tavares scored her second goal in as many games (and second of the season) three minutes into the seven-on-seven overtime to break a scoreless deadlock and hand Taunton its first postseason win in program history. The first attack of the overtime period went to OA, but the Taunton defense made the stop and quickly transitioned down the other end of the field. Senior Liana Duartebullied her way past three OA defenders to create the scoring chance and on the third rebound Tavares was on hand to knock in the loose ball. OA senior goalie Caitlin Grant nearly kept out Taunton in overtime, sliding out and using her whole body to stop not only Duarte’s initial shot but also the first rebound. In fact, OA would not have even gotten to the overtime, if Grant had not come through with a kick save in the final seconds of regulation to deny Diana Brens off a Tavares assist. What made the victory even more impressive for Taunton is that the Tigers were playing without leading scorer Kya Enos. The senior forward was sidelined with a concussion and forced to miss the playoff game, but for Hathaway and Fox this was a sign of the team’s depth. It was a game that featured back-and-forth action, but few clear-cut chances for either team. In the first half, neither team was able to put a shot on target and the two goalies only combined for three saves in regulation. In the 17th minute, Sarah Stevens set up Hannah Stryke, but the freshman’s first-time shot was just wide of the post. Ten minutes later, Taunton nearly created an opening goal with a straightaway shot by Cierra Bartel off a Brens pass that also went wide. Defensively, both teams looked strong, despite the youth that both teams had out on the field. Taunton had sophomores Kathryn Robinson, Jocelyn Pagliuca, and Rylie Murphy at the back, while OA had freshmen Emily Han and Brynna Courneen making stops in the defensive unit. Off a second half corner, Murphy blasted a shot that Grant blocked aside and off the post, but the official’s whistle called off the effort. Six minutes later, Taunton again had a good chance when Lauren Torres crossed for Brens but the senior was unable to get a touch to the pass. The visitors were next to create chances with Maggie Woods got to a loose ball right in front but the shot missed wide and then Woods was fed by Stevens in front but her shot was kicked aside by Taunton goalie Emma Sheehan. Jillian Pagliuca fired a long-range shot at the OA goal and Hannah Blackwell was open on the post but was unable to make contact and knock it in during the final, frenetic moments of regulation. In the end, it was Tavares, who scored 64 goals for the lacrosse team as an eighth grader, that came through in the clutch with the winning touch. It was just her second career field hockey goal, but it was a memorable one, sending Taunton into the second round for the first time. Taunton (11-7-1, 8-7-1), the No. 16 seed, will advance to face undefeated top seed Somerset-Berkeley on Saturday afternoon at 3:00. Oliver Ames finishes the season at (9-7-3, 8-6-2). Attleboro, 3 @ Milford, 2 – Final – Attleboro’s Abby Boudreau scored a pair of goals and Grace Mayer netted the game-winner as the Bombardiers edged Milford. Shannon Cormier scored both of the Scarlet Hawks’ goals, one off an assist from Danielle Fokas. Taunton, 1 @ Canton, 5 – Final – Canton scored three unanswered goals in the second half to break open a one-goal game. The Bulldogs led 2-1 at the break but netted three straight to register a big win over the visiting Tigers. 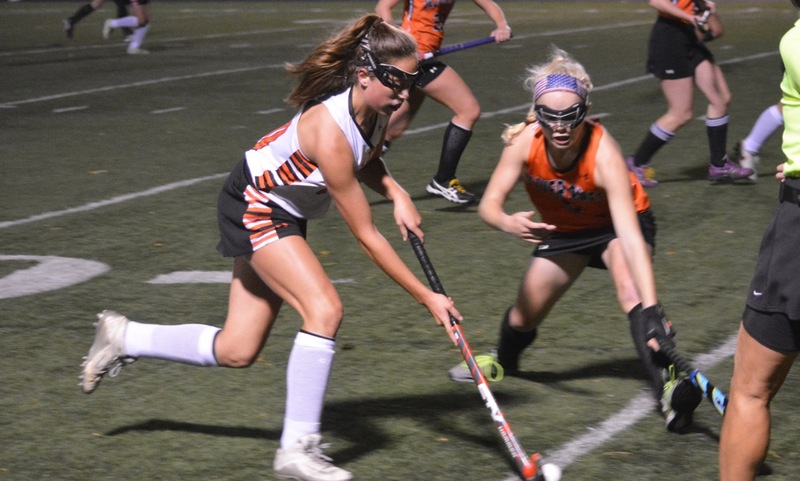 Oliver Ames, 2 @ Foxboro, 4 – Final – Oliver Ames cut a three-goal deficit down to one but Foxboro junior Sophia DiCenso scored her second goal of the game to give the Warriors some breathing room in a win at home. Lily Daly and Jamie Notarangelo also scored for Foxboro. Liz Nuss and Sarah Stevens scored with Emily Han and Kayla Lozzi grabbing assists for OA. Tigers head coach Abby Tepper added that Brynna Courneen played well defensively. Franklin, 4 @ Stoughton, 0 – Final – Franklin junior Anna Jardine made 12 saves to help the Panthers notch their first shutout of the season, winning 4-0 on the road at Stoughton. Junior Regan Paterson paced the Panthers’ offense with a goal and an assist. Cassi Ronan, Annie Walsh, and Erin Walsh also scored while junior Ashley Reutlinger recorded an assist. Mansfield, 1 @ North Attleboro, 1 – Final – Mansfield and North Attleboro traded goals and had to settle for a 1-1 draw on Tuesday afternoon. Tara Nair scored for the Rocketeers off an assist from Kayley Gorman while Hayleigh Crawford found the back of the cage for the Hornets on a feed from Ann Maher. Canton, 1 @ Oliver Ames, 3 – Final – Oliver Ames rallied back after dropping the first game to win the next three and take the match at home (22-25, 28-26, 25-20, 25-23). Emma Petrillo notched a season-high 23 kills to lead the Tigers offensively. “She played an incredible offensive game and executed at crucial points throughout the match,” said OA head coach Chelsea Cunningham. Sophomore Allie Kemp notched a career-high 50 assists in the win, junior Sadie Homer had 26 digs and senior Kayla Raymond finished with 13 kills and four blocks. Erin Devine had 12 kills and four blocks for Canton while Nicole Brown added 29 assists and seven kills. Sharon, 1 @ Franklin, 3 – Final – Franklin junior Lauren McGrath paced the Panthers’ offense with 27 assists and seven kills while Maggie Doyle added six kills and five blocks and Lauren Bissanti had 13 digs and a pair of aces. Milford, 3 @ Mansfield, 1 – Final – Milford picked up the upset on the road, taking wins in the first, third and fourth games to get the win (25-22, 20-25, 25-22, 25-20). For Mansfield, Meg Hill had 17 kills, Julia Harrison had 11 kills and 15 digs, and Jolie O’Neil and Sam Sternberg combined for 31 digs. Stoughton, 3 @ Taunton, 0 – Final – Val Whalen led the way for the Black Knights with 15 kills, nine digs, and 11 service points. SHS coach Erica Batchelder said senior Haley Stone and junior Mia Bennett both played strong from the back row. Franklin, 159 @ Canton, 157 – Final – Canton senior Jack Goyetch earned match medalist honors for the fifth straight match, earning the honors after shooting a low round of 37. Chris Lavoie (39), Joey Vaughan (40) and Thomas Singleton (41) all placed for the Bulldogs. Franklin’s Bryan Woelfel and Jason Collins each shot 38 for the Panthers. Milford, 191 @ Taunton, 182 – Final – Taunton’s Jack Patneaude shot a team-low round of 42 to pace the Tigers to a win at home. Cam Williams added a 45 and Jack Giebel shot a 46 for Taunton. Oliver Ames, 158 @ Attleboro, 169 – Final – Oliver Ames senior Ryan McGarry eagled the second hole (par 5), finishing with a medalist round of 36 to lead the Tigers to a win on the road. Matt Kelley and Tate Hadges each shot 40 for the Tigers. Stoughton, 203 @ Mansfield, 162 – Final – Freshman Ryan Dow led the way for the Hornets, carding a team-low round of 39, to help Mansfield earn the win and qualify for the state tournament. Nate Morreale, Brian See, and Madison Haughey all shot 41 for Mansfield. Oliver Ames, 37 @ Mansfield, 23 – Final – Mansfield’s Kalin Petrov clocked in at 16:39 to win the race, helping the Hornets take down visiting Oliver Ames. OA’s Jason Windvogel and Zane Reservitz took second and third, respectively, with Mansfield’s Collin Rice taking fourth.